At the airport we were joined by other guests from Idaho, Florida, Oregon, and Guatemala. 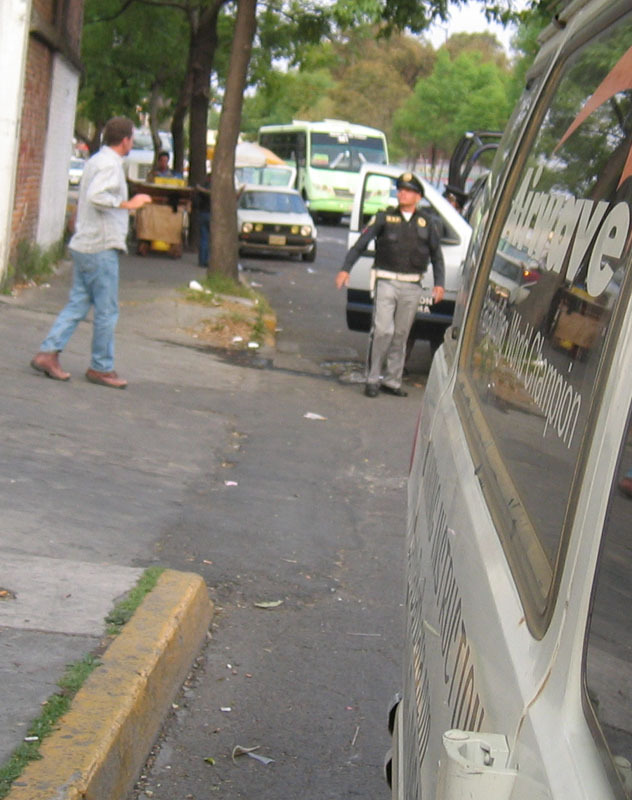 On the way out of Mexico city, we had a chance to get to know each other as we experienced the hospitality of the Mexican police. Chris and Ada tag-teamed the cops and got the bribe down to $200, learned the secret password, and we were on our way again. Kev showed us all the road signs that were pointing in different directions than the previous Saturday, and the roads that used to go to Valle, but didn’t any longer. I was really appreciating the “fully catered” portion of the trip so far! We got to the house in VDB, and I felt like Jed Clampet just arriving in Beverly Hills. It wasn’t a house, it was a Hacienda. A huge place, with cathedral ceilings and a veranda bigger than my whole house. Every bedroom had its own bath and fireplace, the lawns looked like the third hole at Pebble Beach, and the hot tub was big enough for swimming laps. RaeLynn and I got the master bedroom (another reason to bring your wife). Dirty laundry left on the floor was washed, folded, and returned the next day - no wife involved. Every morning, no matter how early I got up, fresh coffee was already brewed, and the kitchen elves were squeezing oranges for our breakfast OJ. Kevin McGinley made sure we were well taken care of each day at breakfast and dinner. The food was excellent. It was plentiful and each day we got a lesson in the culinary arts with an explanation of an exotic spice, or some wild grain that allowed four foot Mayans to build huge pyramids. Steak, lobster, chicken, pasta, we had it all. My favorite (I only mention it as nobody has ever heard me say this before) were the salads. I could have been happy eating just the salad. No desserts though; we’ll have to work on that for next year. The next morning we were taken to all the LZ’s along the road between town and launch where we were briefed on that LZ, also programmed our GPS’s, then it was off to launch. Now I said this was a fully catered tour and I should explain what I meant. 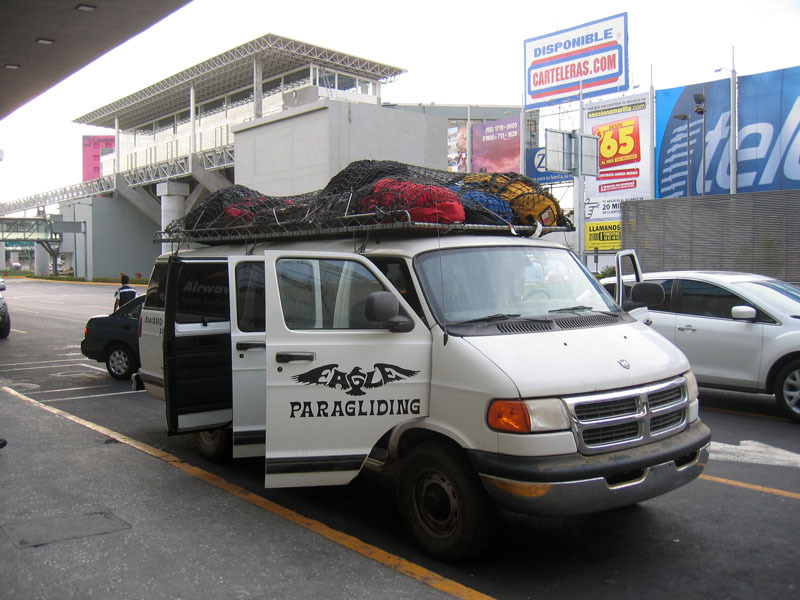 I’m sure that if you were willing to spend the time and money you could arrange transport from the airport to Valle De Bravo. You could probably have gotten accommodations that came close to the master suite at the Eagles Nest if you planned far enough in advance. Transport to launch can be arranged in town, and as long as you land next to a paved road you can hitchhike or haggle with a taxi driver for retrieve. You won’t get meals like Kevin was serving up at Jovans or the taco stand; maybe there is a restaurant in town that can match the level of cuisine we enjoyed, but you won’t be having that meal in the company of your fellow pilots. All of these luxuries make it special, and separate it from the dollar-a-day tours of Mexico. What really made this trip worth while was that we had eight pilots and five instructors. Plug that into your student-teacher-ratio calculator and tell me where else that happens. 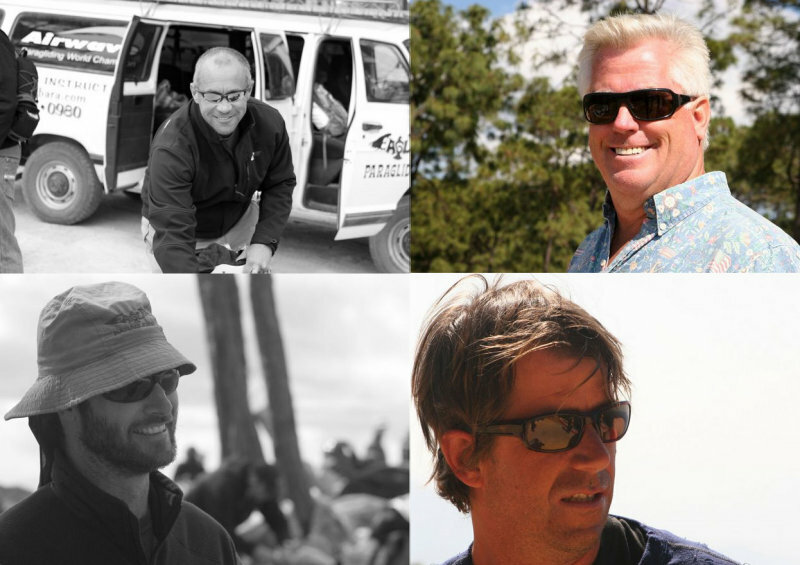 And this wasn’t Larry, Moe, and Curley; this was Rob, Brad, and Ritchie (check the Monarca final results, you’ll see them at the top of the list) These guys were amazing with the amount of attention, and the level of coaching they provided. Even with a hundred pilots in the air they could pick us out, knew what we were doing (or should have done) and where the best lift was if we were in trouble. Every day, every pilot got feedback on what they were doing and how to improve their technique. Each night we reviewed the days events and discussed the options and choices that could have been made. Valle is pretty infamous for the circus at launch, and we witnessed many scary take offs from the other groups. The Eagle team made sure we were all prepared, well coached, and supported through the launch. In fact, the involvement of the instructors, and the performance of our group on launch and in the air was such that the “Northern Europeans” switched their radios to 146.46 to listen in on what we were doing and followed us! The coaching continued during the flight both from the ground and from the air. Each day they’d get us off launch, and when we were situated the instructors would launch and we would gaggle up. Then it was team flying for a cross-country adventure. I managed to rack up four months worth of flight time in one week in VDB. I can’t emphasize enough the value of a team of coaches making sure you have your best possible flight, even for a pilot as highly recognized as myself (weeks of experience, and I won a hat at the SBXC!) I did my best to look like I didn’t need any tips, but I was busy listening to the tips offered up to the rest of the group and trying out those strategies. 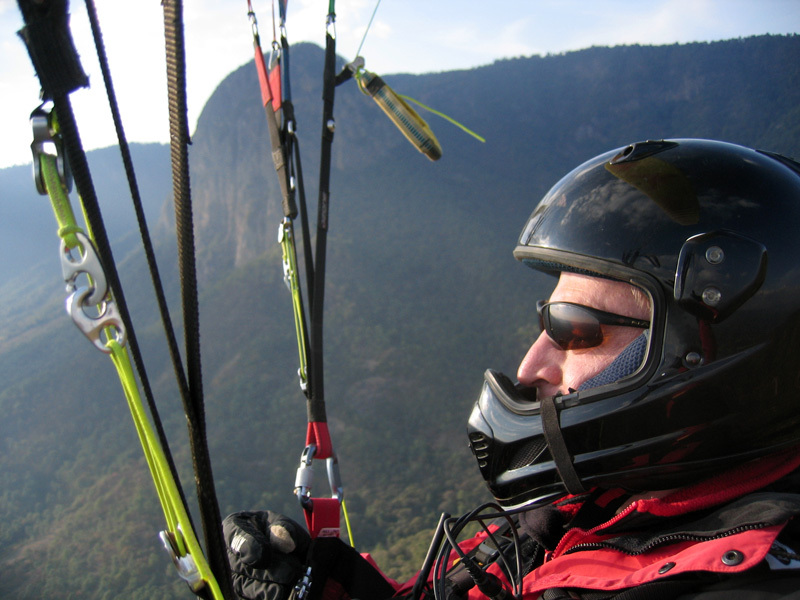 I changed the way I turn; I used my speed bar more than in the last ten months; I added ballast and adjusted it up and down to get a feel for how it changed my flying; I hung out in zero sink, long after I normally would have been folded up and made it to the lake with a thousand feet to spare. I pushed myself and when it worked, I was pumped; when it didn’t, retrieve came along and took me back to launch. What could be better? If you’d like to get away from the rain next season, if you’d like to get months worth of flight time in one week, if you’d like a fully catered vacation, talk to Rob when he gets back from the comps. 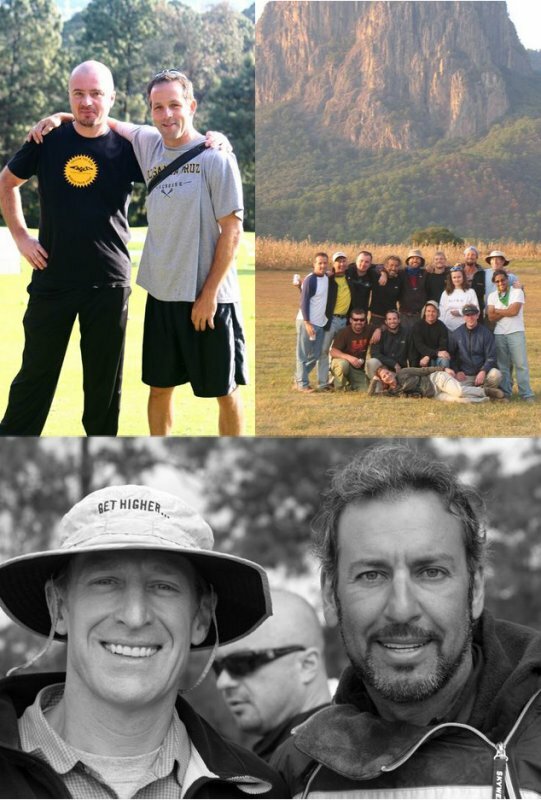 I think it would be great if we could get a bunch of Topa and SB pilots with similar skill levels together for a customized training session in Valle with the big dogs from the Eagle team. The only way to improve on that would be dessert after dinner. Robb, What a fine write up! 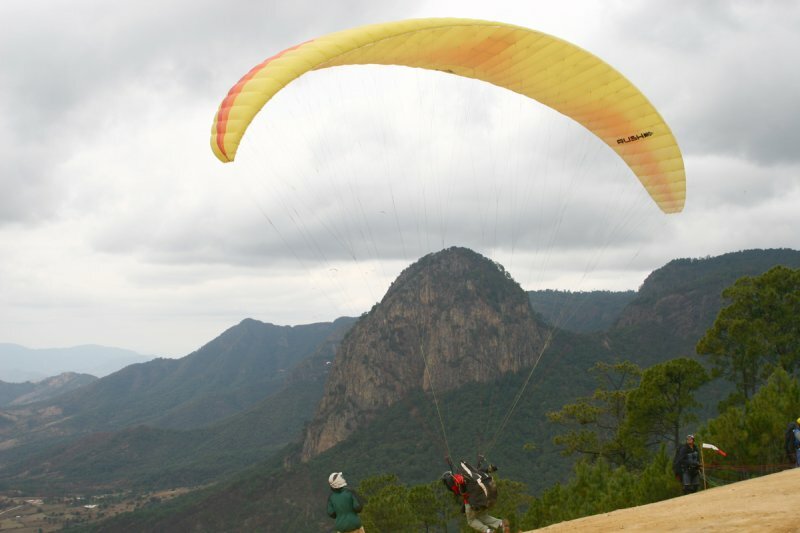 Pitcures with words, makes us really understand what a Valle De Bravo trip with Eagle Paragliding is all about. I look forward to next year..... Ofcourse Im aiming for the trip to France with the Eagle crew this year. Nice report Rob. sounds really cool. That is such an inviting write-up!! Very very nice..... I hope to join in next year!! 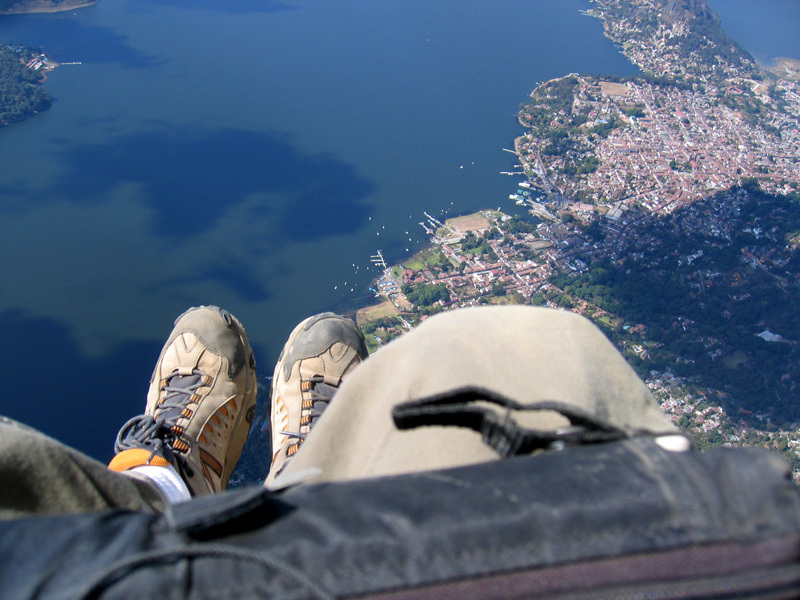 Great pictures and a tempting, tantalizing "I wish that I was there" description. A taste of the sky cannot ever be forgiven. I put up my shots from both comps on PBase tonight. 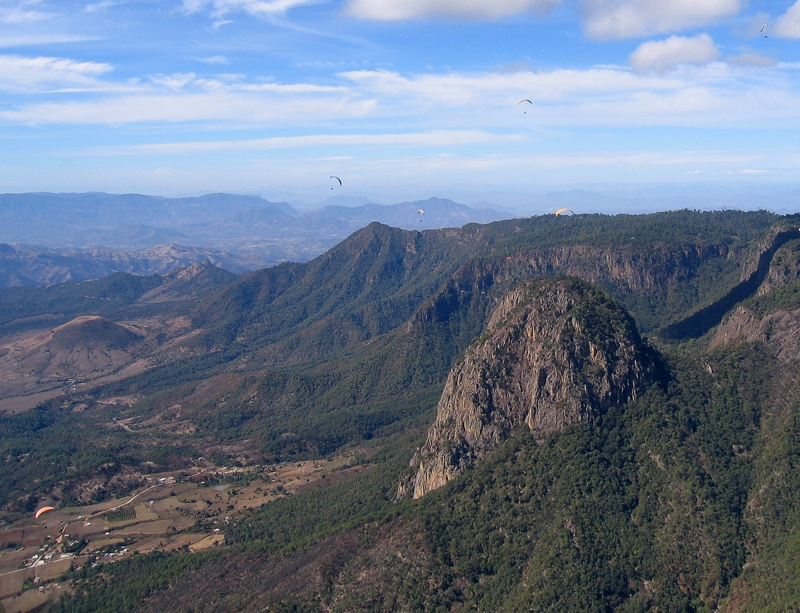 We flew every day, Valle De Bravo is unbelievable. Milley has asked me to talk about both comps at the next club meeting the Sunday after next; I believe it's the 17th. For now I'll let the photos do the talking. I also took several videos when I was down there. One of the videos was on the Monarch butterflies that migrate there every year. We just happened to be driving through the area when they were moving down to the area where they drink. We pulled over and I shot some video of the never-ending stream of butterflies.